Be the first to share your favorite memory, photo or story of David . This memorial page is dedicated for family, friends and future generations to celebrate the life of their loved one. 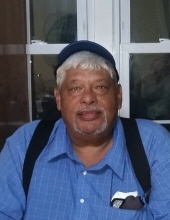 Mr. David Ray Cummings of Lumberton was born on November 9, 1953 in Robeson County to the late David Cummings and the late Beulah Benford Oxendine Cummings and departed this life on Friday, April 12, 2019 at Southeastern Hospice House completing his journey of 65 years. Along with his parents, he is preceded in death by his wife: Barbara Ann Burns Cummings, and two sisters: Myrtle Dorothy Cummings Chavis and Regina Cummings Locklear. The funeral will be Monday, April 15, 2019 at 2:00 P.M. at Riverside Independent Baptist Church with the Revs: Nick McNeill, Jerry Ray McNeill, and Davey Locklear officiating. Burial will follow at Lumbee Memorial Gardens. Mr. Cummings leaves to cherish his memories, his son: Samuel Ray Cummings and girlfriend, Maranda Hunt of Pembroke; five siblings: Don Earl Cummings and wife Annie Neal of Rowland, Larry Alton Cummings of Shannon, James Mitchell Cummings Sr. and wife Betty of Rowland, Rita Faye Cummings Wilkins and husband Jackie of Rowland, and Ronnie Dean Cummings of Raleigh and a host of nieces, nephews, and friends. The visitation will be Monday, April 15, 2019 from 1 P.M. -2 P.M. at Riverside Independent Baptist Church. To send flowers or a remembrance gift to the family of David Ray Cummings, please visit our Tribute Store. "Email Address" would like to share the life celebration of David Ray Cummings. Click on the "link" to go to share a favorite memory or leave a condolence message for the family.